Scottish Celtic Wedding Ring For Men Or Women : LOVE2HAVE UK! 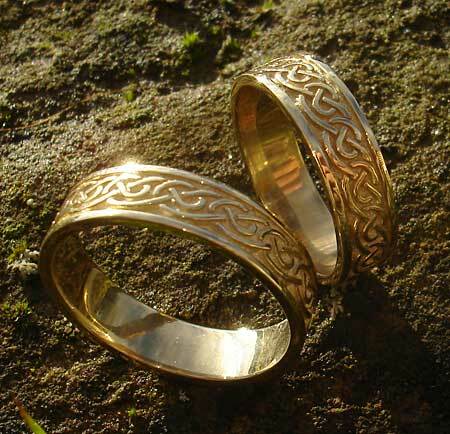 A traditional Scottish Celtic gold wedding ring with a classic Celtic knot outer pattern. The 9ct gold version is pictured, but this ring is also available in white and rose gold too. 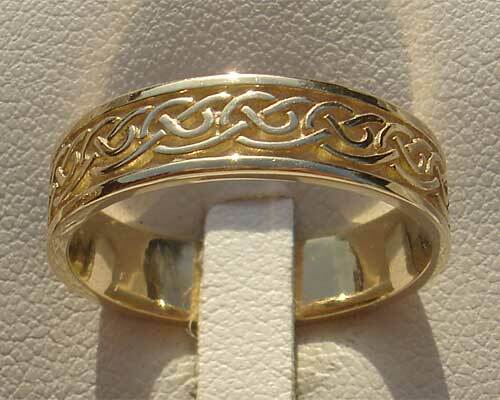 It measures approximately 5mm wide and is suitable for a men's or ladies Celtic gold wedding ring. The exterior Celtic knotwork design signifies Celtic eternity engraved around the entire outer circumference of the ring. Handcrafted in Scotland, this ring is, therefore, a genuine gold Celtic ring. The Celtic engravings and patterns worked into our range of Celtic wedding rings signify nature and duality and are related to the well-known Yin and Yang symbol. 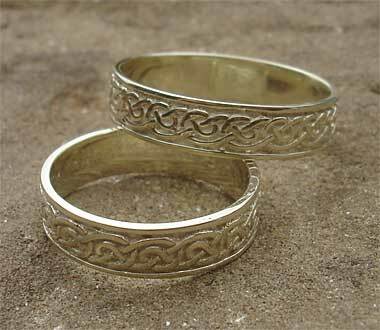 This Celtic ring is a perfect example of this, and pictured below are a Celtic wedding ring set for him and her. Returns Policy: You may return this Scottish made Celtic wedding ring if it is not to your satisfaction as long as it is not engraved. Please see our terms and conditions.